Bacterial growth is the asexual reproduction, or cell division, of a bacterium into two daughter cells, in a process called binary fission. Providing no mutational event occurs, the resulting daughter cells are genetically identical to the original cell. Hence, bacterial growth occurs. Both daughter cells from the division do not necessarily survive. However, if the number surviving exceeds unity on average, the bacterial population undergoes exponential growth. The measurement of an exponential bacterial growth curve in batch culture was traditionally a part of the training of all microbiologists; the basic means requires bacterial enumeration (cell counting) by direct and individual (microscopic, flow cytometry), direct and bulk (biomass), indirect and individual (colony counting), or indirect and bulk (most probable number, turbidity, nutrient uptake) methods. Models reconcile theory with the measurements. In autecological studies, the growth of bacteria (or other microorganisms, as protozoa, microalgae or yeasts) in batch culture can be modeled with four different phases: lag phase (A), log phase or exponential phase (B), stationary phase (C), and death phase (D). During lag phase, bacteria adapt themselves to growth conditions. It is the period where the individual bacteria are maturing and not yet able to divide. During the lag phase of the bacterial growth cycle, synthesis of RNA, enzymes and other molecules occurs. During the lag phase cells change very little because the cells do not immediately reproduce in a new medium. This period of little to no cell division is called the lag phase and can last for 1 hour to several days. During this phase cells are not dormant. The log phase (sometimes called the logarithmic phase or the exponential phase) is a period characterized by cell doubling. [dead link] The number of new bacteria appearing per unit time is proportional to the present population. If growth is not limited, doubling will continue at a constant rate so both the number of cells and the rate of population increase doubles with each consecutive time period. For this type of exponential growth, plotting the natural logarithm of cell number against time produces a straight line. The slope of this line is the specific growth rate of the organism, which is a measure of the number of divisions per cell per unit time. The actual rate of this growth (i.e. 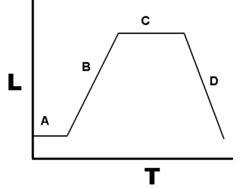 the slope of the line in the figure) depends upon the growth conditions, which affect the frequency of cell division events and the probability of both daughter cells surviving. Under controlled conditions, cyanobacteria can double their population four times a day and then they can triple their population. Exponential growth cannot continue indefinitely, however, because the medium is soon depleted of nutrients and enriched with wastes. The stationary phase is often due to a growth-limiting factor such as the depletion of an essential nutrient, and/or the formation of an inhibitory product such as an organic acid. Stationary phase results from a situation in which growth rate and death rate are equal. The number of new cells created is limited by the growth factor and as a result the rate of cell growth matches the rate of cell death. The result is a “smooth,” horizontal linear part of the curve during the stationary phase. Mutations can occur during stationary phase. Bridges et al. (2001) presented evidence that DNA damage is responsible for many of the mutations arising in the genomes of stationary phase or starving bacteria. Endogenously generated reactive oxygen species appear to be a major source of such damages. 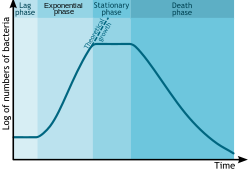 At death phase (decline phase), bacteria die. This could be caused by lack of nutrients, environmental temperature above or below the tolerance band for the species, or other injurious conditions. This basic batch culture growth model draws out and emphasizes aspects of bacterial growth which may differ from the growth of macrofauna. It emphasizes clonality, asexual binary division, the short development time relative to replication itself, the seemingly low death rate, the need to move from a dormant state to a reproductive state or to condition the media, and finally, the tendency of lab adapted strains to exhaust their nutrients. In reality, even in batch culture, the four phases are not well defined. The cells do not reproduce in synchrony without explicit and continual prompting (as in experiments with stalked bacteria ) and their exponential phase growth is often not ever a constant rate, but instead a slowly decaying rate, a constant stochastic response to pressures both to reproduce and to go dormant in the face of declining nutrient concentrations and increasing waste concentrations. Near the end of the logarithmic phase of a batch culture, competence for natural genetic transformation may be induced, as in Bacillus subtilis and in other bacteria. Natural genetic transformation is a form of DNA transfer that appears to be an adaptation for repairing DNA damages. Batch culture is the most common laboratory growth method in which bacterial growth is studied, but it is only one of many. It is ideally spatially unstructured and temporally structured. The bacterial culture is incubated in a closed vessel with a single batch of medium. In some experimental regimes, some of the bacterial culture is periodically removed and added to fresh sterile medium. In the extreme case, this leads to the continual renewal of the nutrients. This is a chemostat, also known as continuous culture. It is ideally spatially unstructured and temporally unstructured, in a steady state defined by the rates of nutrient supply and bacterial growth. In comparison to batch culture, bacteria are maintained in exponential growth phase, and the growth rate of the bacteria is known. Related devices include turbidostats and auxostats. When Escherichia coli is growing very slowly with a doubling time of 16 hours in a chemostat most cells have a single chromosome. Bacterial growth can be suppressed with bacteriostats, without necessarily killing the bacteria. In a synecological, true-to-nature situation in which more than one bacterial species is present, the growth of microbes is more dynamic and continual. Liquid is not the only laboratory environment for bacterial growth. Spatially structured environments such as biofilms or agar surfaces present additional complex growth models. Environmental factors influence rate of bacterial growth such as acidity (pH), temperature, water activity, macro and micro nutrients, oxygen levels, and toxins. Conditions tend to be relatively consistent between bacteria with the exception of extremophiles. Bacterium have optimal growth conditions under which they thrive, but once outside of those conditions the stress can result in either reduced or stalled growth, dormancy (such as formation spores), or death. Maintaining sub-optimal growth conditions is a key principle to food preservation. Psychrophiles are extremophilic cold-loving bacteria or archaea with an optimal temperature for growth at about 15 °C or lower (maximal temperature for growth at 20 °C, minimal temperature for growth at 0 °C or lower). Psychrophiles are typically found in Earth's extremely cold ecosystems, such as polar ice-cap regions, permafrost, polar surface, and deep oceans. Mesophiles are bacteria that thrive at moderate temperatures, growing best between 20° and 45 °C. These temperatures align with the natural body temperatures of humans, which is why many human pathogens are mesophiles. Optimal acidity for bacteria tends to be around pH 6.5 to 7.0 with the exception of acidophiles. Some bacteria can change the pH such as by excreting acid resulting in sub-optimal conditions. Bacteria can be aerobes or anaerobes. Toxins such as ethanol can hinder or kill bacterial growth. This is used beneficially for disinfection and in food preservation. ^ a b Skarstad K, Steen HB, Boye E (1983). "Cell cycle parameters of slowly growing Escherichia coli B/r studied by flow cytometry". J. Bacteriol. 154 (2): 656–62. PMC 217513. PMID 6341358. ^ Zwietering MH, Jongenburger I, Rombouts FM, van 'T Riet K (1990). "Modeling of the Bacterial Growth Curve". Applied and Environmental Microbiology. 56 (6): 1875–1881. PMC 184525. PMID 16348228. ^ Fankhauser, David B. (17 July 2004). "Bacterial Growth Curve". University of Cincinnati Clermont College. Archived from the original on 13 February 2016. Retrieved 29 December 2015. ^ Case, Christine; Funke, Berdell; Tortora, Gerard. Microbiology An Introduction'Italic text (Tenth Edition). ^ "Marshall T. Savage - An Exponentialist View"
^ a b Bridges BA, Foster PL, Timms AR (2001). "Effect of endogenous carotenoids on "adaptive" mutation in Escherichia coli FC40". Mutat. Res. 473 (1): 109–19. doi:10.1016/s0027-5107(00)00144-5. PMC 2929247. PMID 11166030. ^ Novick A (1955). "Growth of Bacteria". Annual Review of Microbiology. 9: 97–110. doi:10.1146/annurev.mi.09.100155.000525. PMID 13259461. ^ Anagnostopoulos C, Spizizen J (1961). "REQUIREMENTS FOR TRANSFORMATION IN BACILLUS SUBTILIS". J. Bacteriol. 81 (5): 741–6. PMC 279084. PMID 16561900. ^ "Psychrophiles and Psychrotrophs". www.els.net. Retrieved 2018-02-06. ^ "Mesophile - Biology-Online Dictionary". www.biology-online.org. Retrieved 2018-02-06. ^ Blamire, John. "Effect of pH on Growth Rate". Brooklyn College. Retrieved 8 October 2016. Wikimedia Commons has media related to Bacterial growth. Science aid: Bacterial Growth High school (GCSE, Alevel) resource. This article includes material from an article posted on 26 April 2003 on Nupedia; written by Nagina Parmar; reviewed and approved by the Biology group; editor, Gaytha Langlois; lead reviewer, Gaytha Langlois ; lead copyeditors, Ruth Ifcher. and Jan Hogle.